Powers/Abilities: Magma wears a costume that grants him superhuman strength (enhanced human) and durability (especially to heat). His primary weapon is his magma projector, which can project streams of molten lava or fire red-hot lava rocks faster than the speed of sound, enabling them to pass through a two foot thick block of titanium steel. His lava gun can resist direct hits from Iron Man's repulsor rays, and he wears a power glove that enhances his striking force. He also has used a "specially designed miner's ax," and his visor has been able to fire blasts of geo-thermal energy. He uses advanced equipment for a number of purposes, such as activating and releasing dormant tensions with the Earth. He sometimes uses large pieces of machinery as weapons, and he had used air-car devices for transport. His most powerful weapon was his pod. 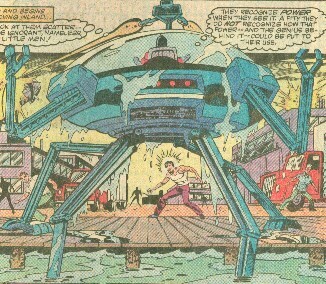 (Marvel Team-Up I#110 (fb)) - Jonathan Darque was a legend in engineering circles. He ran his own mining company using innovative methods and machinery to gather the earth's treasures more abundantly and efficiently than ever before. He saw himself as being essential to helping the USA meet its energy demands, but he progressively developed more protestors over the scorched, barren earth he left in his wake. Darque ignored the protestors and continued his work until his wife--who meant more to him than even progress--was killed in a car wreck while swerving to avoid demonstrators at one of his excavation sites. Soon after, a class action suit was filed against his company; Darque lost was ordered to permanently close down all operations. Darque swore to use his greatest remaining resource, his brain, to gain vengeance on the ignorant society that had done this to him. 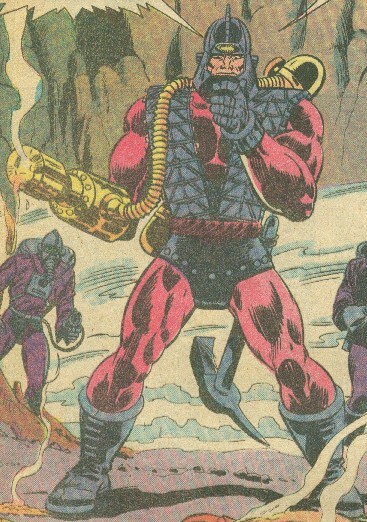 (Marvel Team-Up I#110 (fb) - BTS) - Darque designed a costume and weaponry to become Magma. He continued working on advanced equipment and recruiting a number of agents to assist him. (Marvel Team-Up I#110 (fb) - BTS) - Magma allegedly caused a major eruption of Washington state's Mt. Saint Helens volcano. (Marvel Team-Up I#110 (fb)) - Magma plotted to cause the destruction of New York City unless that municipality's government paid him one hundred million dollars. Magma knew they wouldn't be able to raise the money in time. (Marvel Team-Up I#110) - After an earthquake rocked New York City, Tony Stark called a news conference at the Long Island branch of Stark International to announce his investigation of its causes, and the Daily Bugle's Joe "Robbie" Robertson sent Peter Parker to take pictures. As Stark spoke of his Long Range Sonic Stata Scanner which would allow him to locate the source of all future tremors or quakes even half-a-continent away, an earthquake rocked Stark Enterprises, and Spider-Man and Iron Man narrowly stopped the immense scanner from crushing the nearby crowd. Spidey and Iron Man used Stark's Turbo-Bore to tunnel down to the quake's source, but shortly after their arrival in the immense subterranean cavern, they were attacked by Magma's agents. The agents dropped Spider-Man with knock-out gas, and Magma subdued Iron Man with a magma burst from behind. Magma placed the two heroes in stasis, and when they awakened he regaled them with his origins. After Magma left them, Iron Man destroyed the circuitry restraining himself and Spider-Man. Iron Man confronted Magma as he delivered his ultimatum at New York's City Hall. As the two battled, Magma activated his tremor inducer, but Spider-Man managed to figure out the machinery well enough to divert the shock wave along a secondary fault line, sending it out to sea. His plot foiled, Magma told Iron Man he would never take him alive, and he flew his aircraft into the site of the volcanic eruption caused by the earthquake. (Iron Man I#169 (fb)) - Magma's uniform enabled him to absorb the heat within the volcano and to survive the experience. (Web of Spider-Man#17 (fb)) - Magma returned to his base and rejoined his employees. (Iron Man I#169 (fb) - BTS) - Magma established a new base in the North Atlantic, where he and his agents plotted to prove Darque's genius by defeating Iron Man. In this way he hoped to regain his eminence as one of the world's foremost engineers. (Iron Man I#169) - After ranting to his agents, Magma entered his pod, traveled across the ocean floor and headed for Stark International's Long Island facility. Learning of this, Stark donned his Iron Man armor and went after him; however, Stark had recently been driven back into alcoholism by plots of Obadiah Stane, and the drunken Iron Man was ineffective against Magma's pod. Magma wondered if there might be two Iron Mans, and that he was battling the lesser. 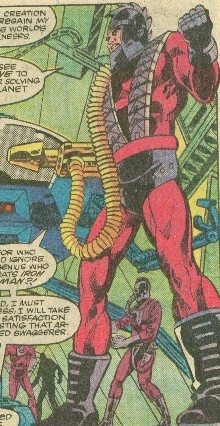 Ultimately, Iron Man fled back to Stark International, where he attempted to super-charge his armor with Stark's central generator, which drew power from every energy source on the plant. The drunken Stark forgot that he had donned an older model of armor after damage to the current model, and the older model could not handle the charge, resulting in a power outage across Stark International. Realizing he could no longer function in battle, Iron Man led Jim Rhodes to his private sanctum, where he revealed his true identity. Stark had a few more drinks to fortify himself for battle, but soon passed out. As Magma continued his rampage through SI, Rhodey donned the Iron Man armor. (Iron Man I#170) - Iron Man (Rhodes) attacked Magma's pod repeatedly to little effect, even when he caused an immense tank of liquid oxygen to explode around him. Ultimately, Obadiah Stane, who intended to takeover Stark International and didn't want to see the facility leveled, dispatched one of his Knights against Magma. The Knight fired a weapon into Magma's pod which completely shorted out its electrical systems, rendering it useless. Abandoning the pod, Magma broke into a nearby building, which happened to be Stark's sanctum, where he found the inebriated and half-naked Stark and knocked him to the ground. Iron Man (Rhodes) then entered and managed to dodge Magma's blasts until his weapon ran out of ammunition, at which point Iron Man easily overpowered him. He turned the unconscious Magma over the Stark International's security and dumped his pod in Lem's Salvage's junkheap. (Web of Spider-Man#17 (fb)) - Darque was contacted by a representative of Roxxon, who offered him a position. He was placed in charge of a research complex hidden in the Appalachians, the site chosen due to its proximity to natural geo-thermal power sources...and because it was generally considered fairly useless by the world at large and therefore free from prying eyes. Work progressed steadily, but slowly. (Web of Spider-Man#16 (fb) - BTS) - Shortly after the closing of the main factory in the poor Appalachian town of Temple Corners, Magma's men moved in on the town. In order to work without disruption, Magma paid each resident of Temple Corners $1000 per day to pretend like nothing was happening. (Web of Spider-Man#16 (fb) - BTS / Web of Spider-Man#17 (fb)) - Darque's intelligence sources learned of young Seth Hanks, an a idiot savant immensely gifted in mathematic calculations. Magma had Seth and his mother Charla brought into the mountain base. Magma told the people of Temple Corners that his payments were also contingent on them keeping Charla and Seth Hanks in line. (Web of Spider-Man#17 (fb)) - Seth Hanks soon devised a breakthrough formula in the field of Broadcast Power, which was energy beamed to a distant site that can excite the electrons of any matter to point where it explodes. 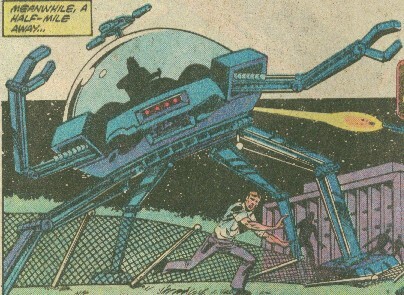 Roxxon and Darque wished to develop this as a weapon to effectively project "bombs" instantly anywhere on Earth, though Darque intended to use it to set himself above governments so he could pursue his goal of "providing the world with cheap energy without the moronic restrictions applied by left-wing ecological dreamers." (Web of Spider-Man#16 - BTS) - When Magma's men brought Seth and Charla back to their home to get clothes and other supplies, the Hanks escaped, but the people of Temple Corners, who did not wish to lose the prosperity that Magma had given them, recaptured them. (Web of Spider-Man#16 - BTS) - Seth was taken back to the mountain base while Charla was contained by the townspeople. (Web of Spider-Man#17 (fb) - BTS) - The Broadcast Power projectors were nearly perfected. (Web of Spider-Man#16) - Peter Parker and Joy Mercado, having been sent to Temple Corners to do a human interest piece on the declining city, stumbled onto Charla Hanks. 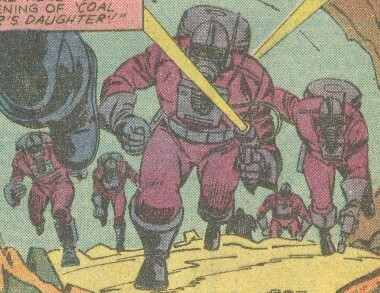 When Magma's men arrived to reclaim the Hanks, they captured Joy and Peter, too, as Peter restrained himself to prevent any of the innocents from being harmed. However, once within Magma's mountain base, Parker caused a distraction, escaped, and returned as Spider-Man, taking out several agents and investigating the base. As Spider-Man helped Joy and the Hanks to escape, Magma arrived and confronted him. (Web of Spider-Man#17) - Joy and the Hanks were recaptured by Magma's men, and Spider-Man, knowing that only he could rescue them, retreated to avoid getting roasted by Magma. However, Parker then allowed himself to be recaptured so he could stay close by Joy. The two of them broke out of their cell, freed the Hanks, and began to make their way out of the mountain, then Peter pretended to fall so that he could lead Magma's men away from the others, and so he could go after Magma himself. 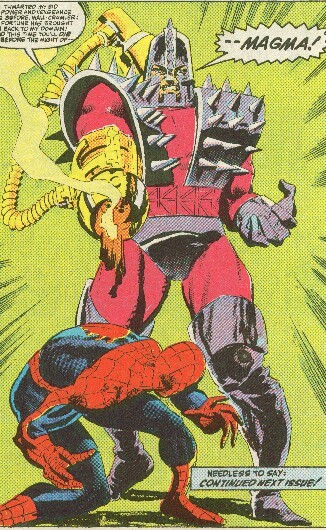 As Spider-Man fought Magma, he kicked Magma's lava weapon, causing a blast to strike one of the Power generators, destroying its focusing link and causing it to project electron-intensifying energy at random, devastating the mountain base. When Seth went back to try to "rescue" Peter, Spider-Man brought Seth back to safety so he could escape with the others, but a blast from Magma destroyed the exit tunnel before Spider-Man could enter it. Spider-Man made his way towards a newly produced crack, avoiding blasts from Magma, and the Projectors overloaded and blew up. (Quasar#3 (fb) - BTS) - Magma survived the destruction of his mountain base. (Quasar#3) - Magma battled the Human Torch in Brooklyn. The Torch mocked him while melting the conduit to his lava projector, destroying his tank, and then melting his boots into the asphalt. Comments: Created by Herb Trimpe, David Michilinie, and Mike Esposito. The Mayor of New York City in MTU#110 was Ed Koch, but that's topical. Iron Man I#170 is the issue that convinced me to start collecting Iron Man, back when I was a callow youth of twelve. It marked the start of a 2.5 year period in which Rhodey replaced Stark as Iron Man. Web of Spider-Man#17 was to have marked the end of Spider-Man's red suit, as he switched to the normal cloth version of the symbiote suit, but obviously that didn't last. I think it was the Simpsons where someone referred to Homer as being like and idiot savant...without the savant part. Broadcast power was also used by the Time Keeper and his agents, who worked for AIM. That story preceded the Web of Spider-Man one by about a year. Both stories involved Michilinie. Magma received an entry in the Spider-Man - Back in Black Handbook. In this entry his wife's name was revealed. Murphy and Gonzalez were named. They wore protective body suits including gas masks, anesthetic gas dispensers, and energy guns. They were presumably useful for tunneling through rock, moving through magma, etc., though they weren't actually shown in use. They were in his base below Long Island. Magma used this effectively in his assault on Stark International until its electrical systems were destroyed by one of Obadiah Stane's Knights. It was highly durable, showing no injury from direct assaults from either Iron Man, or even an explosion of a large holding tank of liquid oxygen. Its limbs were strong enough to restrain and pin Iron Man, and even to force him down against his full jet thrust.